The convention edition of the Kansas Sunflower Auctioneer is now available. 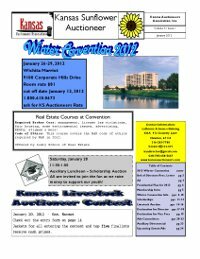 It features the scoop on the upcoming 2012 KAA Winter Convention in Wichita including candidate bios for the upcoming elections, registration forms, Auctioneer Championship entry forms, scholarship forms, the education schedule and much more. Pick up yours today from the members section.